Are you a man who frequently feels isolated, irritable, and withdrawn? Do you find yourself spending long hours at work or habitually drinking to avoid dealing with everyday issues in life? These coping strategies are not only unhealthy, but they are also warning signs that you may have male depression. Depression is a mood disorder that is characterized by a persistent feeling of sadness, tiredness, loss of sleep, or sudden disinterest in everyday activities. It affects how you feel, how you think, and how you behave, and can lead to several emotional and physical problems. The symptoms of depression in males are similar to the ones experienced in females—although men can express these symptoms quite differently. For example, depression with females will more likely trigger feelings of insignificance or sorrow. With men, depression may cause them to become withdrawn or act hostile and aggressive. Fatigue: Men who are depressed can go through a variety of physical and emotional changes, including a slowing down of thought processes, movements, and even speech patterns. Irritability: Rather then feeling down, men who are depressed will often display signs of irritability and aggravation. When speaking about emotional issues, it may be accompanied by a tone of frustration. Anger or hostility: Some men deal with depression by acting hostile, angry, or aggressive. Experts believe that a man who realizes something is wrong may feel the need to compensate by showing that he is still strong or capable. Stomachaches and pain: Digestive disorders and chronic pain are associated with depression. Men who are depressed can also experience constipation, diarrhea, headaches, and back pain. Difficulty concentrating: Negative thoughts that are constantly running through a man’s brain can affect his ability to concentrate and focus on his daily responsibilities. Sexual dysfunction: Performance problems in the bedroom can be the result of depression—in fact, depression is a common reason for erectile dysfunction and it can also make depression worse for men. Suicidal thoughts: Depressed men may experience recurrent suicidal thoughts or thoughts of death. And although depression isn’t a common factor in aging, older men are at the highest risk for suicide—more than 70% of older suicide victims saw their doctor within one month of their death. Resisting mental health treatment: Some men may suspect that they have depression, but will avoid diagnosis and refuse treatment because they are worried about damaging their careers or are afraid their friends and family will lose respect for them. 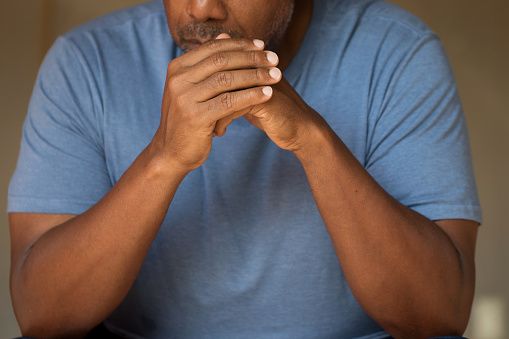 Downplaying signs and symptoms: Some men may not want to recognize how much the symptoms are affecting their lives and downplay the symptoms as a result. However, ignoring or downplaying symptoms won’t make depression go away. Refusing to discuss symptoms: Some men might not think it’s manly to express the feelings associated with depression, so they suppress their feelings instead. Healthy lifestyle: Living a healthy lifestyle, which includes eating healthy and exercising regularly, will help promote better mental health. Activities: Participate in activities that you enjoy. Goals: Set realistic goals for your life. Start with day-to-day goals and once you feel you can take on more, set weekly goals. Support: Don’t deal with depression alone. You may feel that no one can help you, but receiving assistance from a friend, family member, or healthcare provider will help you get on the road to recovery. Decisions: Avoid making crucial decisions until you have gotten the proper treatment and help for your depression. Talk therapy: Psychotherapy or talk therapy are effective in treating depression. You can also try cognitive-behavioral therapy, interpersonal psychotherapy, and insight-oriented psychotherapy. The goal of these treatments is to change disruptive behaviors and thought processes that are behind one’s difficulties. “Selective serotonin reuptake inhibitors (SSRIs),” Mayo Clinic web site, July 9, 2013; http://www.mayoclinic.org/diseases-conditions/depression/in-depth/ssris/art-20044825. “Depression in Men,” WebMD web site; http://www.webmd.com/depression/depression-how-recognize-what-do-about, last accessed October 1, 2015. “Depression in Men,” WebMD web site; http://www.webmd.com/depression/depression-men, last accessed October 1, 2015. “Male depression: Understanding the issues,” Mayo Clinic web site, May 15, 2013; http://www.mayoclinic.org/diseases-conditions/depression/in-depth/male-depression/art-20046216?pg=1. “Depression (major depressive disorder),” Mayo Clinic web site, July 22, 2015; http://www.mayoclinic.org/diseases-conditions/depression/basics/definition/con-20032977. Zamosky, L., “12 Signs of Depression in Men,” Health web site; http://www.health.com/health/gallery/0,,20521449,00.html, last accessed October 1, 2015. “Serotonin: 9 Questions and Answers,” WebMD web site; http://www.webmd.com/depression/features/serotonin, last accessed October 1, 2015. Tags: Depression In Men, Male Depression, Male Depression Causes, Male Depression Symptoms, Male Depression Treatment, Male Depression Undiagnosed.